The endless expansion of production in pursuit of maximum private profit is the basis of our global capitalist economy. This system is environmentally unsustainable, and has also resulted in increasing inequality, enduring poverty, ruinous misallocation of resources and a series of devastating financial crises. 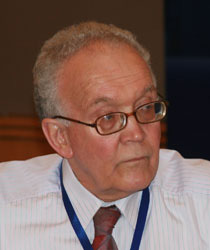 Harry Shutt is an economic consultant, commentator and author who has long been a critic of capitalism. He asserts that the system is now outmoded, especially in view of modern technological advance, and that it must inevitablyevolve into a less dysfunctional structure. His books include The Trouble with Capitalism: An Inquiry into the causes of Global Economic Failure (1998); A New Democracy: Alternatives to a Bankrupt World Order (2001); The Decline of Capitalism: Can a Self-Regulated Profits System Survive? (2005) and most recently Beyond the Profits System: Possibilities for a Post-Capitalist Era published by Zed Books in 2010. This entry was posted in 2013 and tagged Harry Shutt. Bookmark the permalink. Venezuela under Chavez: dictatorship or model for radical democracy? China takes over the World – Myth or reality? Global Nuclear Disarmament: Utopia or necessity? The Last Taboo: What to do about the global sanitation crisis? Venezuela: can the Bolivarian Revolution resist the forces of the right? Philanthrocapitalism: who really benefits from the Philanthropy Industry?